The future of home construction? A Chinese company has created giant 3D printers that can build 10 full-sized, detached single-storey houses in a single day's work. WinSun, a private firm, used four 10m x 6.6m printers to spray a mixture of cement and construction waste to build the walls, layer by layer. As the buildings are made using recycled materials and the process does not require labour, each house can be printed for just £3,000. Ma hopes his printers can be used to build skyscrapers in the future and has plans to build an entire villa using the same process. The company also intends to build 100 recycling facilities around China to help keep up with demand. 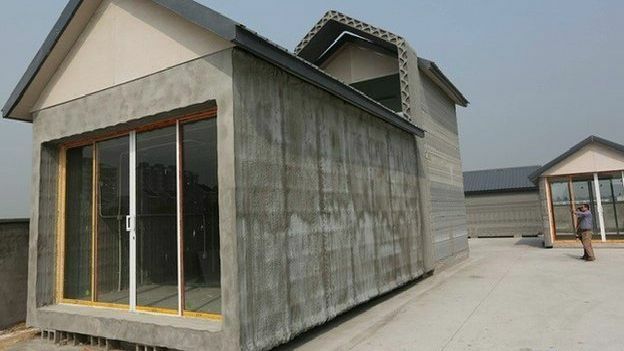 China has also announced the first 3D printed house project will be located in Qingdao. 3D printing is moving forward rapidly with the ability to produce a wide range of things from everyday items such as jewellery and furniture to more advanced items such as cars. Could this be the future of home construction? Let us know in the comments box below. Looking to jump on the 3D bandwagon? Check out T3's round-up of the Best 3D printers to buy now.